Announced during Nintendo's Nindies Direct in March, side-scrolling action platformer The Messenger has caught our eye by keeping a retro feel but subverting player expectations, using classic graphical styles to compliment a time-travelling narrative. When a small, isolated village is attacked by an army of demons, the task of carrying a sacred scroll across a cursed world falls to you - a young ninja student. 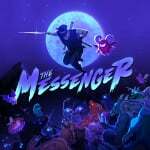 Armed with both an array of powerful weapons and acrobatic abilities, The Messenger aims to put a fresh spin on a beloved genre. We took the chance to talk to Thierry Boulanger, Martin Brouard and composer Eric W. Brown from developer Sabotage about the game. Nintendo Life: So, are there many ninjas in Quebec?! Thierry Boulanger: Ha! I wish there were! I guess it depends on your definition. I’ve never seen anyone in Quebec doing front flips and chopping off demon heads, but then it may simply be because I’ve never seen any demons either. But if you look at it from the conceptual angle, Ninjas setting their ego aside to give their all to a cause they deem meaningful and being impossibly good and at what they do with full dedication, I’d say my grandmother was a ninja. There are callbacks to classics like Shinobi and Ninja Gaiden in your game, but are there any other influences? TB: The short answer is “all the games!”. Indeed, Ninja Gaiden is the biggest influence as far as moment-to-moment gameplay is concerned. But more precisely, and without giving too much away, when it comes to the story, cast of characters, dialogue and late game mechanics, players should also feel the love for Metroid, Castlevania: Symphony of the Night, and even Monkey Island. Also, while The Messenger doesn’t have directly identifiable game mechanics relating to Chrono Trigger, it is by far my favourite game and biggest influence. It’s kind of subtle I guess, but careful attention has been paid to its key takeaways, like keeping things lean in general and having a script with a high density of surprises and meaningful events. The Messenger has been a passion project of yours since childhood. How has the journey been from inception to imminent release? TB: Emotional. I mean it’s been almost 25 years for me, since I was drawing ninjas back in elementary school. I never really gave up on that little world, just thinking up nuggets of story or moments that I thought would be cool to see in a ninja adventure. About ten years ago I did the obligatory awful prototype as I was studying game programming, then it took me eight years to finally have the courage to quit everything and give my humble game idea a real shot, shifting from code to design overnight. I still can’t believe it all ended up happening. All these incredibly talented people who decided to join Sabotage and make this all a thing, I don’t think I’m ever getting over that. I guess I understand better now how it’s the journey and not the destination that matters. No matter what happens past this point we made it up to here, and nothing is taking that away, ever. The game is now done and we are just about to announce the release date. Obviously, I can only speak for myself, but I play it a lot these days, and I am in the very fortunate position of being happy with it. I don’t wish we had had an extra two months, or a better animator, or anything. This is truly the best I can do, so I am ready to let the public decide whether or not I deserve to work on my next idea. Fingers crossed! How has the game changed during that time? TB: The ninja, the scroll, the shopkeeper and the time travel (rendered through the 8/16-bit worlds) were always part of the concept, but aside from a few other core pillars, it has changed a lot. Or rather, as a team we let it emerge. It was quite something to feel that moment about a year back, when the game started to speak for itself. It just hit us during a build review that we had reached a point where we felt we had something unique and clearly defined, so from that point on adding content became a process of paying attention to what felt right and listening to the game to let it become more of what it was trying to be. Does that make sense!? Your team is made up of industry veterans and must compliment each other well. How important was the whole team’s contribution to the overall experience during development and the end product? TB: I can’t overstate how important every single team member has been! While I’m certainly the one to blame if the proposed scenario and overall gameplay experience isn’t interesting to players, careful and proper execution is the real make-or-break no matter what the initial idea is worth. We work with a small team that requires no management, where every team member is very good at their respective craft while all being fans of each other. So Mik, our level artist will be like “Eric’s new track is so good, I have to rework that background illustration so it lives up to it”, or I’ll be playing the latest boss and think I should rewrite that intro dialogue. We constantly inspire each other and the team has as much leeway as they care to play with, so the end result is very much the get together of all these minds. You mentioned to us during our hands-on time at Bitsummit that you ‘altered’ the look one of the bosses. What was the design process of the game's characters and environments? TB: The initial concepts always come from a very personal and vulnerable place for me. Everything in The Messenger is a theme or archetype I needed to address, show the world, defeat or redeem in order to move on. It’s my final step to, quite like our hero literally does, leave the past behind. Now while I could talk about the “ramifications of past trauma” and the importance of “reconnecting with your inner child” all day, it’s really all about how it becomes an actual game, and that’s where the team comes in. Things are brought to life thanks to that feedback loop with the team. I mean sure, I’m the “creative head”, but obviously everyone else on the team is also creative. The way I see my role is I have to spark their creativity first and let them go with the minimum amount of limitations (i.e. this boss is an ogre, let’s not make it a car), and from there propositions come in and we go with a design that serves the story and general vision I’m trying to bring into focus, while also making sure the team will be happy to write code and make animations for it all. Maybe that would be a question for the team, but I tried to really make a point to never have anyone roll with something they didn’t agree was an interesting concept to explore. What I’ll provide for a given environment looks like would be along the lines of, “Ok so this area is called the Cloud Ruins, it’s the remnants of a civilization of giants who used to live in the skies. Everything is huge, and structures are floating in the air because of magical runes etched into their bases. It should be a mix of clouds and stone structures, with the player mostly navigating in the upper portion of the screen while the endless pitfall is constantly present below and taking a lot of space, to really work that feeling of being high up and in a precarious situation.” From there we get art, music, and general level design ideas and just iterate all together to hone in on the final version of the base concept. ‘Cloudstepping’ is just one of the cool mechanics our protagonist has at his disposal. How is the game balanced between combat, platforming, and exploration? TB: Cloudstepping is very much core to the gameplay. The idea in level design was to constantly have something to look for, use, and optimize through so that getting to an objective doesn’t feel like task, as you have a neat little mechanic you’re happy to get to use along the way. It’s all about this concept of “resonance”, where a mechanic feeds back into another. Resonance between navigation and combat was the main objective. Through cloudstepping, the loop is created where skilful navigation leads to better combat opportunities like getting behind an enemy, and skilful combat leads to better navigation opportunities like skipping parts of the level. And since we’re very much looking at speedrunnners with The Messenger, it was important to attempt to make a game that has elements to master, where anyone watching can instantly get that a certain move demanded skill. If you’re going to play a Ninja, you should look the part, right? Without giving too much away, there’s also an element of time travel. Does this affect the game narratively as well as aesthetically? TB: Yes! A few hours in you are sent into the future, and that is when the game turns to 16bit. So the past and future worlds a represented by the 8 and 16-bit renditions of the audio and visuals. Eventually, you go back and forth in real time between the two, but yeah, let’s not give too much away! The soundtrack also exists in both 8 and 16-bit. How was this approached? 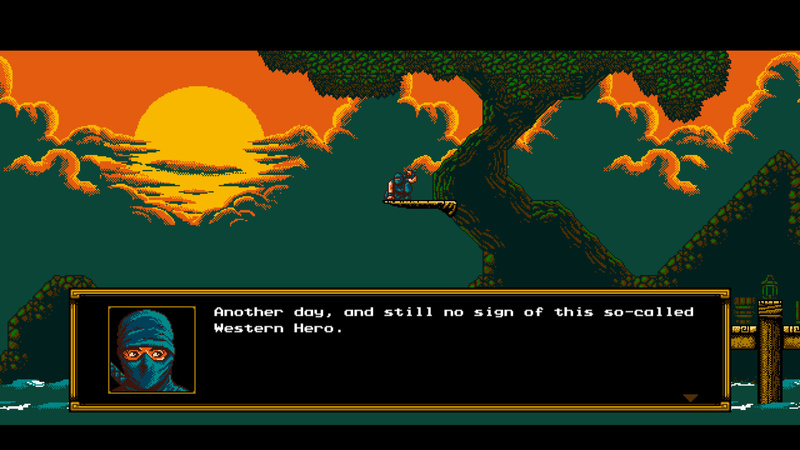 Eric W. Brown: The Messenger's soundtrack needed to be approached with the same level of authenticity and attention to detail that went into the visual and design elements, so the only way in my mind that this could be done is by using special programs that are built around the limitations of the sound chips of yore. I don't mess around when it comes to authentic chiptune, and I can spot a fake from a mile away... but I'm not here to discuss the morality of "fake" chiptune so I'll just tell you about what works for me. It was not as simple as writing a song in an "8-bit style" and then slapping a new skin on it for a 16-bit facelift; each track was programmed from the ground up twice, using two different programs, which are able to output files suitable for playback on the original consoles themselves. The 8-bit music was written in a program called 0cc-Famitracker, which is a modified version of the original Famitracker program with a few subtle differences. I utilized the VRC6 expansion chip (found in some Japanese games like Akumajou Densetsu, the JP version of Castlevania 3) which gave me three additional channels of polyphony to play around with. For the 16-bit side, I used a program called Deflemask, a multi-chip tracker with Genesis sound support. Defle also has the NES chip as an option but does not have VRC6 support, hence the need to use two different programs. I should mention these programs are all in active development and free to download and use, with a community of users around the world. After exporting finished songs from each program, there are inconsistencies in the overall volume of the track as well as a few milliseconds of silence at the start of the NES tracks, so I had to line them up in Logic to make sure the loops were seamless, and throughout the course of the project I was working on my mastering chain to level out volumes and tame some of the harsher frequencies before exporting the final version of what ends up in the game. I grew up as a Genesis kid so it will forever be one of my favourite sound palates, making the decision to go for a Genesis-style 16-bit soundtrack a no-brainer. With a few exceptions, I had the majority of the soundtrack written in 8 before I moved on to 16, but from there I would keep both programs open and just work on copying over one channel at a time until all the notes were in there from top to bottom, then go back around and tweak instrument settings and add effects to make it sound more like music. I used these same programs to make all the sound effects in the game as well. Between using two different trackers on PC, audio software on Mac, and then back to PC for uploading into the backend, no doubt it was a lot of time-consuming file juggling but it's all worth it to get it done right! 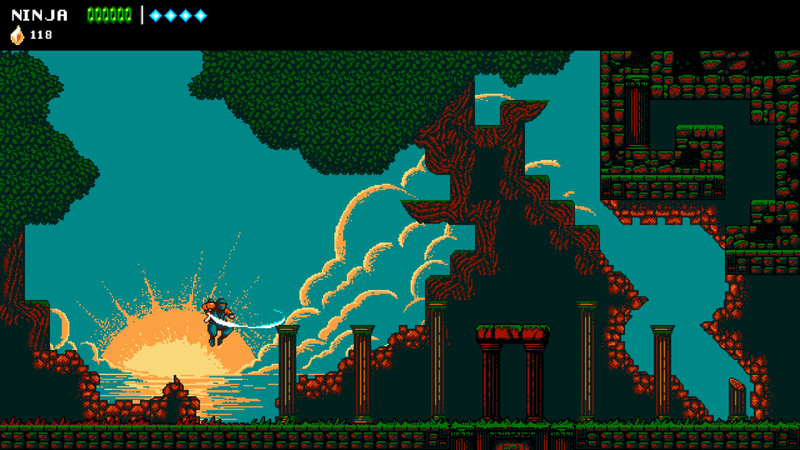 How have you ensured that The Messenger is more than just a homage to the games of the 8-bit era? TB: The idea behind Sabotage is to make games with retro aesthetics and modern game design. I just have a thing for harsh limitations forcing you to have a solid core, kind of like movies before visual effects where you just had to have a great script. The process was to have a lean experience based on moment-to-moment gameplay, and analyze more deeply all these retro games we still play to this day, to figure out the bits that aged well and the elements that should be re-imagined. The general guidelines were to hit the nostalgia string hard, rethink systems where it made sense, and avoid fixing what wasn’t broken. Is there also an element of humour in the game? TB: Definitely. 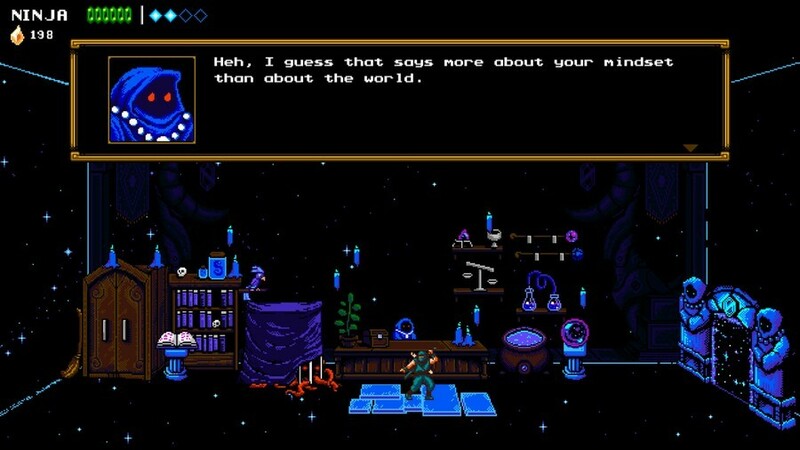 The idea with dialogue, especially through the Shopkeeper, was to make the game slightly self-aware, to acknowledge its influences, and also pick on the clichés these types of adventure. A band like Spinal Tap is a good example of this, where everything is a bit tongue in cheek; making this contract with the player that since we are both aware of the cheesier tropes of these types of games, we can then indulge guiltlessly. What does it mean to you and the team to see your debut game on a Nintendo system? TB: It’s surreal! We all grew up on their systems, and they were the king of the 8-bit era, so it’s both an honour and a natural fit. Everyone at Sabotage feels this way, especially seeing how the soundtrack was made using Famitracker, meaning the music can be exported as a legitimate NES Rom (and I have a feeling Eric does that sometimes, just because he can). 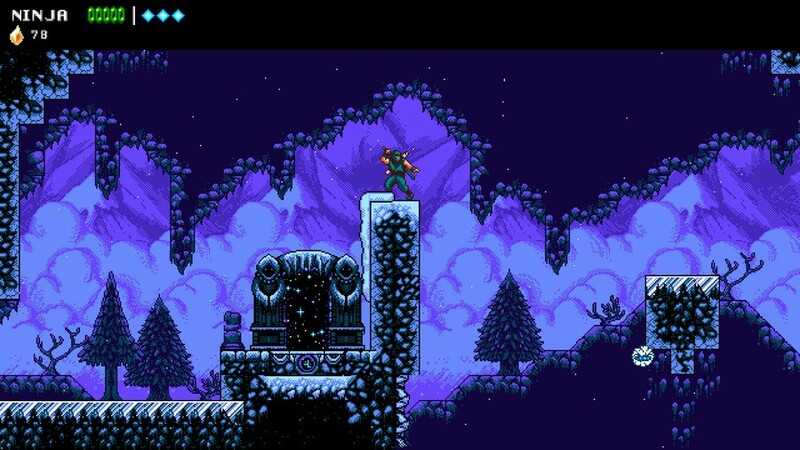 Any update on when we will be seeing The Messenger on the eShop? TB: I wish I could tell you more, but at this point the best I can do is say “very soon”. Probably sooner than you would think by reading this! Any plans for a physical release? Martin Brouard: Of course we’d love to see a physical version of The Messenger, but as an indie developer we need to prioritize the digital launch and see whether it makes sense based on sales. TB: Probably sleep for a few weeks! Then, it will depend on how the game is received. The dream, of course, is to have the means to work on our second project. We’ll see! We would like to thank Thierry, Martin and Eric for their time. As a huge fan of old school ninja gaiden I am so looking forward to this. I usually wait on reviews for indie games but this will be day one for me. I'm down for this! I have a love/hate relationship with the old Ninja Gaiden. As long as this draws from the good aspects and gameplay and doesn't also borrow the unfair aspects, I look forward to it. I like the look, it looks like Shovel Knight but with a Ninja and upgrades. Will keep an eye on this. no wonder why we got Simon and the other guy for smash. This game looks phenomenal, from all the game play I have seen we are all in for a treat. @hatch The thing is, it is very easy to pick out the games that actually are good and have the old school aesthetic vs the money grabs. "retro aesthetics"... there is no such thing. It was just the product of a digital canvas limited by 8 bit tech. I love when people have "nostalgia" for an era where Digital Artist couldn't create what they saw in their heads - but what tech allowed them to make. And then people go waste time and talent faking it to make a buck off them. That's it I need this game in my life. Ninja related games had always been the most exciting part of my childhood: Ninja Gaiden, Shinobi, Shadow of the Ninja, Ninja Five-O, Tenchu, TMNT, Ninja Warriors, Goemon: The Mystical Ninja, etc. This would be sweet to get into. @Agramonte I love when people feel the need to argue that everyone else should agree with their dislikes. I suppose there's also no such thing as appreciation for black and white film, either, or modern directors who choose to work in the medium. Everything looks great, but the main character design is so generic looking. I guess maybe the future version has a bit more identity? How you gonna end up in Smash looking like that? @PanurgeJr First.. saying ones dislikes does not mean they expect everyone to agree with them. Just like people saying their "likes" does not mean they expect me to like it. You have a strange way of reading opinions on a board. Taking the color pallete off a digital canvas (essentially the modern equivalent to B/W) is not the same as limiting it to 8 bit. For your comment to work would be a commercial photographer using Salt and Silver to make a photo plate. I guarantee you nobody does that. Would end up needing to digitize the art anyway. @Agramonte So you don't appreciate what others do. Good for you, I guess? Apparently your sample size of "grown traditional artists" is very, very small. Aggressively trying to invalidate what others enjoy is a weird growing past time on the internet. It's not a good look for anyone, though. 34, proudly use abstract and stick figures in my more "serious" work that totally looks reminiscent of my 3 year-old's scribble. Then again, I don't consider myself an artist, so who's to say you're wrong? Side note though- I wish publishers would use more 32-bit era 2D.... better animation, more detail. SotN still looks halfway decent, some 30 years later. @aaronsullivan Errr... tons of people do not "appreciate what others do"... you never been to an Art gallery opening? And nobody thinks they "aggressively trying to invalidate what others enjoy" when giving that crit... nobody would survive art school (Or a client meeting ) with that mentality. @aznable Outside my comment... pointing out the irony of a so called "aesthetic" that is more a tech limitation. Has nothing to do with who is an artist or not. I doubt if Hideo Yoshizawa was in his 30s today he be making Ninja Gaiden on a 8 bit canvas in a so called "retro aesthetic" it is just a self serving term. I am looking forward to this release, but I am not so sure I like the idea of using the Genesis/Mega Drive sound palate. Older titles had fantastic music (Phantasy Star 2, Streets of Rage, Sonic 1 & 2), but as the space on the carts was needed to house more advanced games, the music quality turned to crap (sound like multi-toned fart noises). Hopefully his music is more like older titles, not newer. @Agramonte You didn't express an opinion. You attempted to "prove" that something people like--the 8 bit aesthetic--doesn't exist, with the obvious implication that they're wrong for doing so. When you limit yourself to expressing opinion I'll accept it as such. As for your guarantees about what techniques artists use, well, I guarantee there are artists using every technique out there, including salt and silver. @Agramonte By that logic you could say that the cell shaded look of BoTW isn't an aesthetic because it was simply Nintendo's workaround to getting a physics based open world working on what is essentially mobile hardware. The origins and limitations that create a style do not invalidate said style. And beyond that, many of us grew up playing 8 and 16bit games. What is wrong with enjoying a game that reminds us of when we were young. I've really been looking forward to this. The soon scares me though. So many games. So little time. @Indielink No, cell shaded is a mimic of an exiting style in a digital canvas. How well it can be implemented depends on the tech. Ninokuni2 is not using it to hide the limitation of my GTX1060. And why I said... that people will go out and fake it to sell it to you. I do not have those memories. Mine are daydreaming as a kid that actual gameplay looked like the cut scenes. Or the intro animation at the start of jRPGs. And that my Wacom actually let me draw what I had in my head. @PanurgeJr No it is not. Nothing in that comment implies "everyone else should agree with their (mine) dislikes". More to do with your reaction to reading a comment you do not agree with. There are "artist" doing just about everything. I said "commercial photographer" I would need to digitize it anyway - so no point. @Agramonte An existing style that originated with games like Jet Set Radio and Wind Waker. Where it was ABSOLUTELY used to hide the limitations of their respective systems. I also find it humorous that you picked Ni No Kuni of all things to make your point, a game whose primary selling point was the art style of Studio Ghibli films. Saying indie developers, "Go out and fake it to sell it to you," is highly dismissive of the games some of these people make and disregarding of the ones that are truly good games. Color me impressed! This looks like something I'd have fun playing. Excellent interview. I love Shinobi and Ninja Gaiden, and it seems that they have put a lot of thought and detail into the 8 & 16 bit music as well, so I am quite excited for this game. I hope it’s excellent!! @Indielink It did not originate in a digital canvas.., it is a mimic of traditional maker rendering that has been around for ages. And yes it is the perfect example - because now the tech is at a point that it "mimics" traditional animation. Not at all. Hideo Yoshizawa, Tomonobu Itagaki or Hideo Kojima didn't keep doing so called "retro aesthetics" just because they made a game on the NES. They moved on with the tech - nothing I said is "discrediting" their work. @Agramonte You clearly have no idea what @Indielink said, but that's not surprising, because you have no idea what you are saying. Every time you say that people using the 8 bit style are faking it you are insulting the current developers who choose to work with it, dismissing their work and implying that they are simply exploitative salesmen. Noting Kojima's career path doesn't change that. Or have anything to do with anything, actually. I wouldn't have got this game if I hadn't read this. I liked the guy, and he did touch on 3 of my old school favorite franchises. I did played all 3 NES Ninja Gaiden games and beat all. 2 and 3 i finished back in the day, the first one I did it on the Wii using save states. That game is way too hard. I'm he's going to find plenty of success with what he's done here, and deservedly so. I watched a showcase of The Messenger on an E3 livestream, and from what I saw of the game, I was genuinely impressed. This will be a title that I will definitely wait in anticipation for its release. @PanurgeJr it has everything to do with what I said. Their games in the 80s had nothing to do with their "style" or Some artistic movement. As soon as a better degital canvas came they moved on. Nonsense, again just your strange need to label an opinion you disagree with as something else. Let it go. Super excited about this game as it looks great and I love the twist of switching between art styles to signify time movement. There is sooo many of these games right now. @Agramonte That somebody in the 80s moved on when technology improved does not invalidate the artistic choice of somebody employing it today. This game looks breathtaking; I can’t wait to play it. I can see the companies fighting for physical distro. Kinda wish we could get another reboot of shinobi...while I wasnt a fan of the artstyle the 3ds game was otherwise a solid entry. I love the older Ninja Gaiden titles. This is a retro game I can actually get behind, but I think most retros should be laid to rest, and remembered for what they were. The Messenger, Hyper Light Drifter and Undertale are the titles this second half of the year that I'm most eager for. @hatch And glad you did. Your usage of Django Reinhardt made my day. A limitation can do both - thrive upon or frustrate. Sure there always art movement – you can’t understand Giacomo Balla’s work without looking at Futurism in early 1900s. Or an “era” in music - where artist will limit their creation to a set writing rule (say Baroque and Heinrich Schütz). But those are set by a joining of equal minds and artistic ideology. “80s” digital art in gaming is not that… nor is it the amazing individuality found in Jazz during the time Django Reinhardt amazed everyone (Do not think people with even 10 fingers today can play how he could – and was a musical genius before his accident). He broke molds and styles all together (and I for one refuse to think it was simply because of his fingers) again nothing like the monotone suffocating restraint of 8bit. Have you notice how people point to a “product” when referring to the so called “style”. For me Django Reinhardt time is more like today - an age where digital art is 1:1. Joe Madureira (Battle chasers) Ari Gibson (Hollow knight) Klaus Lyngeled (Flipping death) can all express an individual "aesthetic" – and that inspire a response. Wes Montgomery did not mimic Reinhardt's “limitation” but his individuality. Sure, if in that freedom the artist chooses to mimic an archaic canvas that is also their right. But not to hijack history - creating some narrative that they a “modern continuation” of some "style" that digital artist willingly embraced in the 80s. That is not true. I do not know maud lewis, but will check it out. @Agramonte Appreciate does not mean to enjoy or like. And I wasn't saying everyone who doesn't appreciate things is aggressively invalidating what others like, I was suggesting that your comment was doing that. You throw in "faking it to make a buck" describing the passionate work people do for the art in their games, and "nostalgia" in quotes as if it isn't valid. I can only guess from your post it's because, in your mind, the style developed out of limitations? Of course, regardless of the reasons for it, there is a real style with a set of visual and motion touch points that form a gestalt that many associate with some of the best gaming experiences they've had. Many people know it when they feel it and seek it out. You aren't going to convince them that "there is no such thing" as a retro aesthetic. It's obviously fine to disagree and critique, but If you really aren't trying disparage those who create and enjoy it, maybe you can just say you don't enjoy it and why. @Agramonte Pixel art is exactly that. "Never meet a grown traditional artist who has nostalgia for "crayon aesthetics" from when they were 6." Come to Des Moines, Iowa. That's all this town has, and the art school rejects gobble it up.